We wait all year for March Madness and then, before you know it, we're down to the Championship game. As ever, it should be a sporting spectacle worth watching and it's really easy to see from a number of outlets. Keep reading and we'll tell you how to get a Virginia vs Texas Tech March Madness live stream regardless of where in the world you are. The Virginia Cavaliers and Texas tech Red Raiders will meet on the court tonight at 8.20pm local time (so 9.20pm ET, 6.20pm PT) to determine who will be this year’s NCAA champion. The National Championship will take place at the US Bank Stadium in Minneapolis, Minnesota and if you happen to live close, tickets are still available at the time of writing for $85 each. Even entering the closing stages of each Final Four March Madness 2019 match-up, it wasn't clear who would be playing in Minneapolis's Championship game. Virginia and Auburn were locked in a tight match and during the last quarter it seemed as if Auburn had it in the bag. However, Virginia’s Kyle Guy made three free throws with just 0.6 seconds left on the clock to win the game and advance his team to the National Championship for the first time in the school’s history. Texas Tech's best player Jarret Culver was missing in action while the team’s most dynamic player Tariq Owens suffered an ankle injury and had to be helped off the court. But guard Matt Mooney showed the world that the Red Raiders can do more than play defense with 22 points that helped the team win the game and earn their spot at the National Championship. So here we are, the number one seed Virginia Cavaliers will play the third seeded Texas Tech Red Raiders in the 2019 NCAA Tournament National Championship game at the US Bank Stadium. 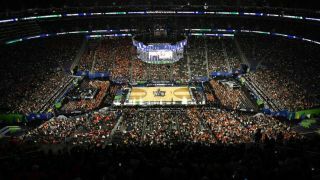 Whether you’re a Virginia fan, a Texas Tech fan or just a fan of college basketball, we’ll show you exactly how to watch tonight’s National Championship game from anywhere in the world so you don’t miss a single basket. Don't miss out on a March madness live stream. It's pretty easy to watch if you're in the US this Saturday night - scroll down and we'll tell you your myriad options for streaming the 2019 Championship Game. 1. ExpressVPN: the best all-round VPN for streaming, comes with 30-day trial and then 3 months FREE with an annual plan. We really admire ExpressVPN's speed, security and simplicity to use - a great plan. From there, you simply open the VPN app, hit 'choose location' and select the appropriate location - it's super easy to do. Choose your country that you know is showing a March Madness live stream and watch as if you were back at home. CBS is the place to watch the National Championship game on your TV. Nice and easy, assuming you have access to that station. If you'd sooner watch online then you can find the action on the NCAA’s own March Madness Live app. The app and accompanying website will show the game when you login using the credentials from your cable provider. Don’t want to pay for a premium cable subscription to watch March Madness? Don’t worry as there are a number of streaming services that give you access to CBS. To make things easier for you, we’ve listed some of the best TV streaming services below. And don't forget about our handy little VPN trick if you're outside the US when you try to watch and find that your preferred broadcaster's coverage is geo-blocked. One streaming service worth considering to watch this year's tournament is Sling TV. The company is currently running a promotion where new users can get 40% off its Sling Orange and Sling Blue packages for the first three months. Basically this means you can watch March Madness 2019 on Sling TV for as little as $15 per month during the tournament. Don't want Sling? Then these other options are worth a look, too. PlayStation Vue $44.99 per month - PlayStation Vue's basic Access package offers over 45 channels including ABC, TNT, ESPN and ESPN2. A 5-day trial to Playstation Vue is also available to help you get started. DIRECTV NOW $50 per month - DIRECTV NOW gives users all the channels needed to watch the NBA and loads of other sporting events. Use DIRECTV NOW’s 7-day trial to test out the platform for yourself. YouTubeTV $40 per month - YouTubeTV gives you access to TNT, ABC, CBS, Fox, NBC and ESPN. Hulu with Live TV $40 per month - Hulu with Live TV includes ABC, TNT, CBS, Fox, NBC and ESPN. March Madness is a phenomenon that doesn't necessarily translate that well globally. But if you want to know what all the fuss is about or you're a US expat wanting to catch the college basketball, then ESPN Player has you covered. It's available in the UK, Europe, Middle East, Africa and parts of Asia and comes at a cost of £9.99/€11.99 for the next month (or £69.99/€79.99 for a whole year to get additional content from ESPN). That gets you live and on-demand coverage of every game from the 2019 March Madness, available on desktop and mobile devices. In the UK and not all that baffled by the popularity of university sport? Then the BT Sport ESPN channel is where you need to be for this one.